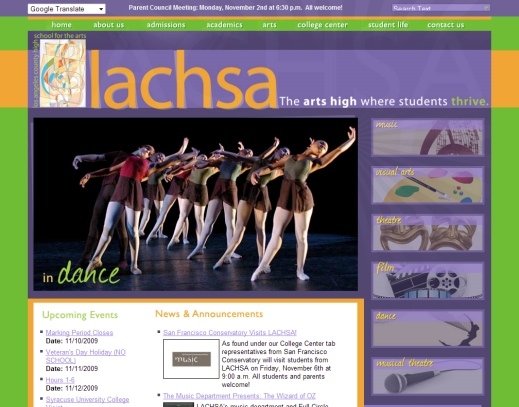 Mark Carlson and I attended a concert given by the Los Angeles County High School for the Arts (LACHSA). My high school days are a very long time ago (1967-71), and I don’t spend any time around high schools these days, so I was prepared for a culture shock. From a school of 579 students in music, art, and dance, we heard a GALA concert (read: everyone plays) with 203 high school musicians. WOW! We heard a jazz band, a gospel choir, an opera excerpt, three piano soloists interspersed, the concert choir, a very large orchestra (!!! ), and saw inspired and gifted teachers and leaders. The performances, yes they are young, were on a very high level. I am thrilled that LA can have such a terrific institution, and I encourage all donors to consider making a donation. Mark and I sat through the 3 and a half hour concert without ever getting bored. It was so fascinating to watch and focus on individual young musicians, seeing their energy and musicality, seeing who are the young Elvises or Madonnas, the Chet Bakers (yes! there was one) and the cool jazzers, already thick with attitude. I felt I was witnessing the ur-Glee. I was impressed that the audience listened in rapt attention to the three piano solos, all brilliantly played. I would have imagined that the parents would lean towards jazz and yawn at the classical: but no, these are parents who paid to have their kids go to an arts school. They LOVE the arts. Silly me. 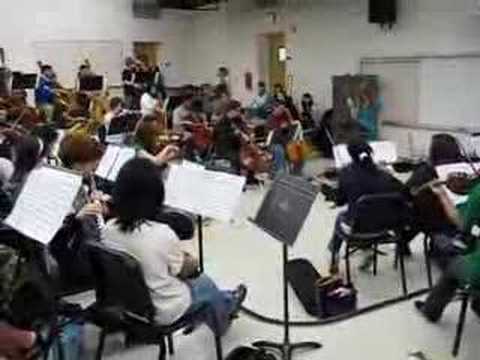 This is a high school where ALL the students are in the arts. There is no Marching Band or football team. Sounds like a dream to those of us who didn’t have that luxury. They are all shapes and sizes and ethnicities. One of the most remarkable observations I made last night was that the students seemed really happy. Most just beamed a kind of happiness. After the curtain went down after the grand finale, we heard a huge WHOOOOOOO from behind the curtain of 203 deliriously happy students who just put on a great concert. There was another level for me. Dr Dan Castro is the musical and organizational force behind this program. I was Dan’s Chair for his Masters and Doctoral degrees at UCLA. In front of a near sold out Luckman Theater on the Cal State LA campus, Dr Castro publicly thanked me for being a mentor and teacher. He also acknowledged Mark Carlson for whom he was a TA, and Jackie DjeDje, Chair of Ethnomusicology. UCLA got a warm applause from the appreciative audience, many obviously proud parents. So, in a sense, I felt like a grandfather of the event, or better, a godfather. And to be thanked is always a nice thing. Take a listen to what they do. This is NOT indicative of what we heard last night, I found this reading of a student arrangement of “Turning Japanese” [do they KNOW what that means??] scored for full orchestra. Yes, it was a wonderful and inspiring evening!